FOUR SEPARATE WEATHER warnings have been issued for tonight as Storm Jake approaches. The coastal fringes of the north, west and south will be worst affected, with a weather advisory issued from 9pm tonight until 8am tomorrow morning. A status orange wind warning will also come into place for that area at 10pm tonight and will remain until 8am tomorrow morning. 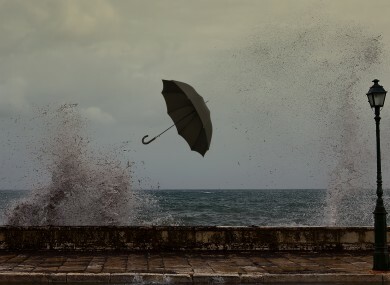 Met Éireann forecasts that westerly winds will increase up to 75km per hour with gusts of 110 to 130km per hour overnight. Meanwhile, another two separate yellow weather warnings have also been issued, including a wind warning for the entire country with westerly winds expected to reach mean speeds of 50 to 65km/h with gusts of 90 to 110km/h. This will come into effect from 8pm tonight until 10am tomorrow morning. A snow-ice warning is in place for Connacht, Leinster, Cavan, Monaghan and Donegal and will see heavy snow showers leading to accumulations of 3cm in some parts. This will also start from 10pm until 9am tomorrow. The Road Safety Authority (RSA) is advising all road users today to take extreme care due to the warnings. Email “Wind and snow-ice: Four weather warnings issued as Storm Jake hits tonight ”. Feedback on “Wind and snow-ice: Four weather warnings issued as Storm Jake hits tonight ”.